A little more than 9 miles from Ragusa in southeastern Sicily sits a beautiful 14th-century castle with a pretty name - Donnafugata Castle. The word translates to “fugitive woman,” but the castle’s name stems from an Arabic word, so there’s no romantic story to go with it. Donnafugata Castle is a patchwork of architectural and artistic styles, including one Venetian Gothic facade and Baroque interior. Visitors can walk through many decorated rooms on the first floor of the castle, including a Hall of Mirrors, smoking room, music room, royal bedrooms, and many rooms with trompe l’oeil paintings on the ceilings. The castle’s gardens are also open to the public, including a Neoclassical temple building among the gardens of Mediterranean trees and plants. Tours of the filming locations for the “Inspector Montalbano” television series typically include a stop at Donnafugata Castle, which figures into the show as the residence of a mob boss. 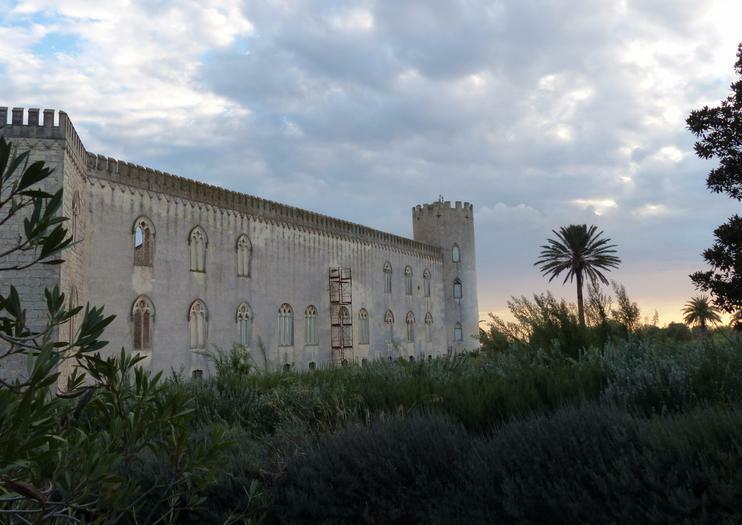 In addition to the “Inspector Montalbano” show, Donnafugata Castle has also appeared in the films “Chaos” and “Il Racconto dei Racconti.” It is not the castle of the same name from the famous book, “The Leopard,” however. If you are passionate about the stories of Commissioner Montalbano, this is definitely the tour for you!The most devoted will have noticed that the places described in the books and those seen in the TV series do not always coincide. In fact the area of the Agrigento described in the novels was "poor" from the scenographic point of view and it is for this reason that the choice of the set fell on the enchanting landscapes of the province of Ragusa. It is here that Baroque architecture coexist, the dense vegetation of olive and carob trees and the typical dry stone walls.In general, the fiction of Montalbano gravitates around Ragusa Ibla, Donnafugata, Puntasecca and Scicli.The Montalbano tour is a must if you want to relive the events of the most beloved commissioner in Italy and beyond! You will lose yourself among nature, art, culture, cinematography, good food and wonderful sea views. 09,00 pick up in hotel and drop off at 04,00 / 5,00 pm.time flexDeparture from you residence or hotel in area Noto, Pozzallo, Marzamemi, Sampieri, Marsasiclà, Baia Samuele, Marispica villages.As they know the admirers of the literary Montalbano, the places where you play the story of the commissioner, often have fancy names, but only the names, however, because these places do exist. The scenes of the set of "Inspector Montalbano" are mainly concentrated in Ragusa, the area of a moving beauty, that the shots Sironi have been able to exploit and make it ideal for the stories and the characters.